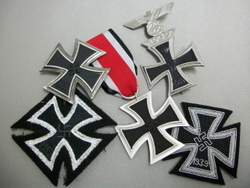 1st Class Iron Cross, 2nd Class Iron Cross, 1914 Iron Cross with 1939 Bar, 1939 Bar to the Iron Cross, 1939 Iron Cross Bullion, 1939 Iron Cross Cloth - 1939 Bar to the Iron Cross 2nd Class w/ribbon. 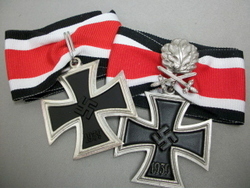 Knights Cross, Knigths Cross with Oak Leave, Knights Cross with Oak Leaves & Swords, Knights Cross Oak Leaves & Diamonds, Oak Leaves, Oak Leaves & Swords, Oak Leaves Swords & Diamonds. 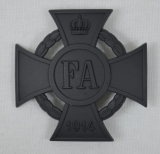 Knights Cross of the War Merit Cross with Swords Gold, Knights Cross of War Merit Cross no Swords Gold, Knights Cross of War Merit Cross with Swords Silver, Knights Cross of War Merit Cross no Swords Silver, 1st Class War Merit Cross, 2nd Class War Merit Cross, Etc. 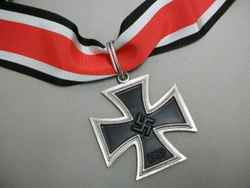 Grand Cross Awards, 1939 Grand Cross of the Iron Cross, 1939 Grand Cross Breast Star of the Iron Cross. 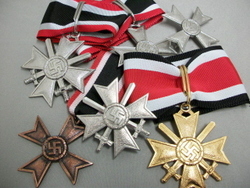 German Cross in Gold on Field Grey, German Cross in Silver on Field Grey, German Cross in Gold on Luftwaffe Blue, German Cross in Gold on Black Panzer & SS.